Who Won The WWE-Denver Nuggets Cage Match? World Wrestling Entertainment is moving next's Monday's "RAW" session from Denver's Pepsi Center to L.A.'s Staples Center, because of the conflict with Game 4 of the NBA Finals. But which petulant business owner really comes out as the victor here? Vince McMahon got to be Vince McMahon, going on TV and calling people idiots, and WWE does get to look generous, offering a second night at the Staples Center and promising to return to Denver later this summer. On the other hand, he had to move his little show and give refunds to all the ticket holders. He can still blame that on Nuggets owner Stan Kroenke, but the important thing is that Vince didn't get his way. Stan Kroenke did get his way, but at what cost? McMahon's jab that Kroenke didn't believe enough in his own team to consider home playoff games still stings (even if it's not really true) and it's probably never a good idea to have 10,000 wrestling fans angry at you. I'm guessing the Pepsi Center won't be holding Wrestlemania 47 or anything, which is too bad for them, because it's really not a bad way to make some money. So who's the real winner? 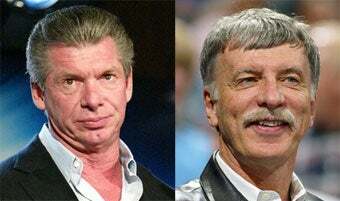 Insult comic McMahon or inept party planner Kroenke? Or is it all the little Hulkamaniacs out there in Southern California?